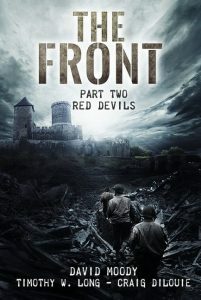 We’re excited to learn that Infected Books have unleashed THE FRONT: RED DEVILS, the second in a trilogy of books set in the Second World War. Described as “Band of Brothers meets Dead Snow” (which we think is an an awesome combination), the first book, SCREAMING EAGLES, was written by Timothy W. Long, and this new release has been penned by David Moody, so with authors of this calibre you can be guaranteed this will be a quality read. The German stranglehold on the town of Bastogne has been released, only for the living dead to rise up and take their place. A ragtag group of men fight their way out of the chaos and make a frantic escape from the rubble and ruin. One of them, British soldier Lieutenant Robert Wilkins, uncovers crucial information about the source of the zombie scourge. Along with a crack team, Wilkins is dispatched to where the outbreak began – the ominously silent concentration camp at Polonezköy, Poland – to try and find a way to halt the undead advance. Released on February 15th, it’s available on Kindle or paperback via Amazon. Or even better, you can purchase a physical signed copy via the Infected Books website (where you also get a free e-book version).